A misaligned machine causes stress to both bearings and shafts. As an effect of this the seals open up, allowing lubrication leakage and contamination to enter. All together the bearings lifetime is dramatically shortened. Laser alignment is the solution. The importance of good coupling alignment is often under-rated. Even with flexible couplings poor alignment results in extra load on the bearings and causes bearings, seals and couplings to wear faster. Our laser alignment system quickly and accurately corrects this problem. 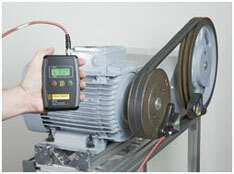 We also provide precision alignment of belts. If you want to do it yourself we can provide the equipment and training to carry out your own laser alignment of couplings or belts.